A 3 year old is now an intricate little person able to sit and play with their own ideas, concerns, and greater command of her body. Now they are at the age where they can dedicate some of their attention to a specific toy its useful to buy the toys that will help them focus on games, arts and crafts, stuffed toys, and many more that helps with the development of their sense. That’s why it’s important to provide them with a variety of toys that helps them develop different skills through play. We have combined that list for you, so you don’t have to do the work. And if you are asking yourself, aren’t these yous great for boys too? the answer is a most definite yes! Here are the best toys for 3 year old girls! What is a better way to teach your little girl numbers and work on the coordination skills than a vibrant colorful bowling pin set with soft foam texture. This educational toy will encourage physical play and number recognition. Click Here to check the current prices! A horse stable with adorable horses is a perfect toy for a 3 year old. I love it as it gives the child the responsibility to take care of the horses and line them up in the stable. This compactable set is perfect to travel with or even take it to the park. It also gives name tags to name their own horses. How adorable is that! Click here to find the current prices! Who doesn’t love nursery rhymes? These interactive books are my absolute favorite for my 3 year old. Make nursey rhymes more fun with piano sounds and bright colors to attract them. Teach them nursery rhymes with these fun visuals and music to grab their attention. Stuffed animals are my favorite! I have my own selfishness invested in these as I personally love them and would mind one for myself in these cold nights to cuddle with one. A unicorn might not be a real but that’s what makes it special for a 3 year old as they love to use their imaginations and creativity and wander in their own little perfect world. If there is one toy that gets used over and over and over by toddlers, it’s a play kitchen. All of our boys and girls have loved playing kitchen in the house. Serving us fake pizza, apples or even coffee. Toddlers simply love this toy and will use for a few years without fail. This kidcraft model is definitely one of the better models out there and is simply adorable (I mean check out the kitchen backsplash) Check Current Prices Here! Your little girl desperately wants a puppy? This puppy set is all you need. What an incredible toy to give to your little girl. She can carry her wherever she goes, throw the bone or the soft ball to fetch, or even brush its hair! IS THIS EVEN REAL? You little girl can even put the puppy to sleep with the cute padded pink bed and the soft blanket. I might as well get this puppy set for myself. 5 stars just for the cuteness! Create an ambiance of a starry night and let them delve in outer space and galaxies. This cute globe shaped light projector will create a soothing and comforting atmosphere in your child’s bedroom and give them an opportunity to go deep in their thoughts. Looking for a present for a 3 year old girl? Pink, purples and butterflies? Yes, I will take it! This perfect watch is a perfect present for a 3 year old girl. Perfect accessory to match their cute little pink dresses and develops the habit of valuing time. Magnetic Blocks are one of my absolute favorite toys for my 3 year old. I love it because not only does it entertain the little guy for quite a while, all my kids enjoy playing with them. Even I find myself sitting down with my little one for a long time playing these magnetic blocks. They are a ton of fun. 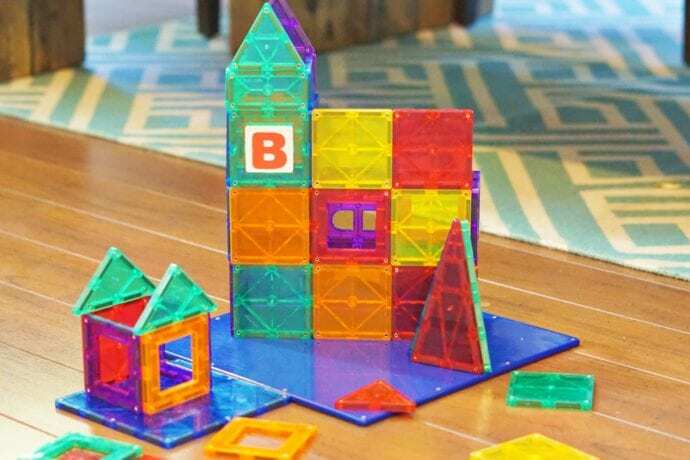 In addition, it is a great way to teach your little one about shapes and colors. Check Current Prices Here! This naughty little age when you can’t get them to sit in one place let them jump and hop around on their Flybar. The hopping on it will have them playful and smiling all day and will also develop balance and coordination. It is such entertainment to watch them jump and laugh on this flybar. Remember those fairy picnics and tea parties? My absolute favorite and brings back so many memories. Making that imaginary tea and serving them in the cute little cups and saucers. This beautiful fairy blossom tea set comes in a compatible suitcase where these little princesses can carry it and take them to their friend’s house or have their cute little tea parties in the park. Perfect age to get them started with their creative arts and crafts thinking. This set gets them to design colorful patterns. This is an amazing way to keep them busy and creative it at the same time. Trust me they will surprise you with their imaginations. My kid absolutely loves this and attracts other kids in the park with this bright and colorful bubble machine as it blows abundant bubbles and lights them as they blow out. This is a perfect gift and trust me no kid is not amazed with bubbles! Even I like to play with it. Parents can equally have fun blowing bubbles and let the kids run around and catch it. Give a mic in the little girl’s hand and let her feel like a pop star! Let them sing, play and listen to music and different sounds and give them the chance to be the star that they are. Who knows this could be the start of career? This microphone makes an echo as you sing giving it a real feel. This is a perfect gift for them to boost the confidence and make them stand out. Play-Doh seems to always rank high as one of the Best Toys for 3 Year Olds. You can’t really go wrong with Play-Doh. The Play-Doh ‘baking’ toy set comes with a cake stand, cutters, stampers, plates, cutlery, and a special icing tool, plus, of course, Play-Doh and ‘confetti compound’. Why we love it? Rolling, squashing and cutting out play dough is pretty much guaranteed 3-year-old fun and combining that with pretending baking makes this set a surefire hit. The reason why kids love to play with Play-Doh generally is because the cake-making element of this set really engages your child and makes them hungry. They can play for much longer because there are so many different things to do and your child never gets bored of this. Check Current Prices Here! I remember having this as a kid but a very basic version of course! This fun fishing game is a family favorite keeping everyone busy and spending quality time with your child. This is an exciting way for your 3 year old to learn numbers and colors. SHAPE SORTER XYLOPHONE – PIANO OR PUZZLE? This is a necessity in every nursery to teach your 3 year old about shape sorting. This shape sorter xylophone will give them to match the puzzle pieces in the matching holes and make a sound to make it more fun and interactive. This is a perfect gift that never fails to impress. Pin for Later – Best Toys for 3 Year Old Girls!